We decide it is time for our first DIY date. To put our virgin DIY skills to the test. Sanding down the left-behinds a bit of a tussle. The bed will go over it, it shall not be seen. Unscrambling DIY manuals is certainly not a thrill. Canopies and decals get stuck on super fast. I have bought new tools, get it done in a mo. Changing electrics is harder than you think. Live, earth, neutral, in a great big tangle. Did we perhaps chew more than we can bite? To fledgling DIY skills and challenges galore. Great post,. It took us 7 hours to change the light in our dining room, so I feel your pain! Ha ha, I love it! 5 hours? That's very impressive!! Bet it looks great. Brilliant! 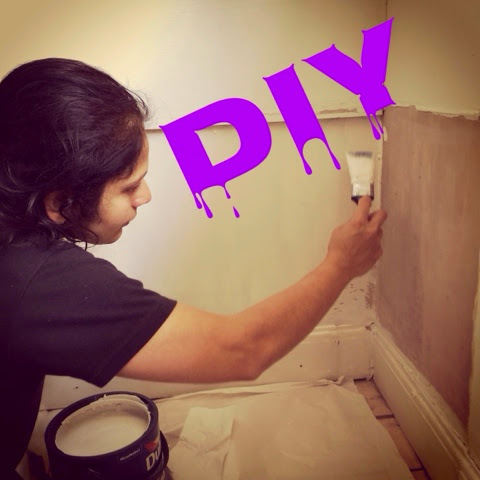 We never get a spare moment for DIY, well done you ! LOVE this poem! I hate DIY and we have SO much of it to tackle!! Ah, we are in the middle of lots of work on the house at the moment so this totally resonates! How fab ! so need to update my daughters . Great poem. I want to see some after photos! Heh heh love IKEA - loving your rhyming skillz! Love your poem! Isn't there such a sense of fulfillment in making something yourself? Ha, this really made me chuckle. We have done a fair amount of DIY in our time :) Thank you so much for linking to #ThePrompt and huge apologies for taking so long to comment, it's been a very busy couple of days! The trouble with decorating is that eventually you have to do it all again. I think it should be one of those one in a lifetime things, like bungee jumping.